On 4 December Russian Ambassador to Belarus said that he greatly respects Belarusian president and thinks that Aliaksandr Lukashenka inspired many by his policies. Ambassador Surikov is not the only Russian inspired by Lukashenka. Lukashenka's populism and pro-Russian rhetoric made him popular among various groups in Russia. Although the popularity of the Belarus development model continues to fall in Russia, it remains attractive for a large part of the Russian population because of various lobbying groups which advocate the interests of the Belarusian regime. These groups include communists, army, nationalists, certain state officials and ordinary Russians nostalgic about the Soviet Union. What Do the Russians Think about Belarus? Until 2008, the attractiveness of Belarus as a reliable ally and a development model was on its peak. Russian people, who were tired of corruption, bureaucracy and low living standards in their own country, considered Belarus as “state for the people” or even a Soviet-style paradise across the border. This myth remained almost unchallenged by Russian state institutions and media until recently. The situation has changed when Belarus refused to recognize South Ossetia and Abkhazia as independent states and then came into a series of conflicts with Russia over the formation of the Customs Union, including gas and milk “wars”. Russian TV channels and newspapers started a massive campaign against Belarus and its leader, using various types of propaganda and unveiling unpleasant facts about Lukashenka family. These measures have decreased public support for Lukashenka’s rule, but have not seriously affected his lobby in Russia. They keep supporting his brave image of Robin Hood who takes money from the rich to redistribute it among the poor and disadvantaged state employees and workers. The first and the most influential lobbying group is the Russian Communist Party led by Gennady Zyuganov. Almost every month he makes positive statements about Belarus and cites its experience as an example worth following. For instance, on 9 October he noted that Russia will benefit from investing money into the Belarusian economy even despite the current financial crisis. Previously Zyuganov defended interests of the Belarusian regime in the Parliamentary Assembly of the Council of Europe. He also appealed to Medvedev and Putin to provide money and other types of help for Belarus without any preconditions. Russian communists are the main opposition party that obtained almost 20% of votes in the latest parliamentary election and their election program highlights the need to actively cooperate with Belarus and to protect it from the “Russian oligarchs”. The second group of support is the Russian military, especially middle-ranking officers who see Lukashenka as a strong leader ruling Belarus. They think he rules the country in a barrack-like manner, not allowing any behaviour deviations such as being a dissident, a hipster, a gay or any other kind of person not in the mainstream. One of the striking examples is Vladimir Kvachkov, former colonel of the Russian Foreign Intelligence Service (GRU), who is thought to be implicated in an attempt on life of Anatoly Chubays – a close liberal aid of Boris Yeltsin in 1990s who currently heads the Russian state corporation Rosnano. Just before the 2010 presidential elections in Belarus, Kvachkov was received warmly in the Belarusian Presidential Administration and was interviewed by the Belarusian government newspaper Respublica. According to Kvachkov, Russian authorities are rogue and they must be replaced by new ones in order to “restore the real Union between Russia, Belarus and Ukraine”. Belarus regularly obtains a considerable amount of new military vehicles, ammunition and equipment at low prices from Russia. Russia faces a rise in nationalist sentiments as a result of interethnic problems related to the North Causasus. The importance of the Russian culture and language is diminishing in most of post-Soviet countries. This is why Russian nationalists view Lukashenka as the only defender of Russian interests in the former Soviet Union. They refer to Belarus as an example of truly pro-Russian and anti-American state where all rights of Russian citizens are respected and the Russian language has an official status. More radical of them tend to imagine Belarus as a place where there are no Gypsies and the people of “white race” occupy the jobs which representatives of Caucasian nations traditionally occupy in Russia. Alexander Prokhanov, a writer and an Editor-in-Chief of the Russian nationalist and often anti-Semitic newspaper Zavtra, is the most visible nationalist advocates of the Belarusian regime in Russia. He spoke highly of the results of the Belarusian presidential elections after his return from the inauguration. Yuri Luzhkov, a Mayor of Moscow and a vice-chairman of the ruling United Russia party used to be one of the most influential lobbyists of Belarusian interests in Moscow. He was allowed to participate in several large business projects in Belarus in return for his friendship with Lukashenka. After Luzhkov was fired from his post, the First Deputy Mayor of the Russian capital Vladimir Resin who was born in Minsk acts as a good mediator between Minsk and Moscow. Pavel Borodin, the State Secretary of the Union State of Belarus and Russia has also done a lot in order to place Lukashenka in a good light in Russia. Evgeniy Primakov, former Russian prime minister and president of the Russian Chamber of Trade and Commerce has also supported Lukashenka for a very long time. Lukashenka himself even called Primakov his teacher. But today Primakov does not hold any important posts, although he still can share necessary contacts. Nevertheless, the Belarusian regime is supported not only by those mentioned above. Many ordinary Russian people genuinely believe that Belarus is a “social state” based on an improved version of communism. In general, these people do not live in big cities, have low salaries, and are used to paternalistic model of state and economic management which Lukashenka represents. Belarusian authorities try to use their propaganda machine to reach the Russian population. Every year Belarus Presidential Administration invites editors and journalists of leading Russian regional newspapers. The presidential administration dines and wines them and shows them the best examples of the Belarusian economic and political model. 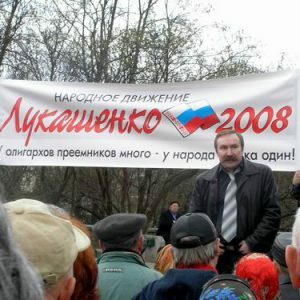 One of the examples of pro-Lukashenka “people’s” projects in Russia is the website Lukashenko2008.ru that has proposed him as a candidate for the Russian presidency. The web site has been online and is regularly updated foe more than 4 years. As Belarus struggles with a severe economic crisis, its policymakers continue their efforts to influence Russian authorities. Since after December 2010 Belarus is increasingly becoming more dependent upon Russia and the role of the West is diminishing. This is why lobbying the interests of the Belarusian regime in Russia is becoming even more important. George Plaschinsky is a graduate of the London School of Economics where he studied under the OESS scholarship by European Comission. The third meeting of the Eastern Partnership Civil Society Forum was held in Poznan, Poland on 28-30 November 2011. The Forum gathered around 300 participants and guests from civil society sector working in EaP countries and EU, including more than 20 representatives of Belarusian NGOs. During three days with an intensive agenda, participants discussed different question on civil society engagement in eastern partnership, challenges and prospects for further development of EaP Civil Society Forum. New Coordinator of National Platform. Director Executive Bureau of the Assembly of Pro-Democratic NGOs, Siarhei Lisichonak, was elected as the new Belarusian National Coordinator of EaP CSF. Lisichenok replaced Ulad Vialichka, EuroBelarus, in his post. Statement of the Eastern Partnership Civil Society Forum. The Eastern Partnership Civil Society Forum in Poznan adopted a Statement on 29 November with a demand of an immediate and unconditional release and full rehabilitation of Ales Byalyatski. The Statement also calls upon the European Union member states to take joint measures toward the release of Ales Byalyatski and other political prisoners. Three Belarusians were elected to the new Steering Committee of EaP Civil Society Forum. A new 17-member Steering Committee was elected at the annual meeting of the Civil Society Forum in Poznan. Three Belarusian NGO activists became Steering Committee members: Siarhei Lisichonak (Assembly of Pro-Democratic NGOs), Olga Stuzhinskaya (Office for a Democratic Belarus), and Yaroslav Bekish (Green Alliance). Information campaign against gender violence. From November 25 to December 10, the Belarusian Association of Young Christian Women conducts information campaign “Say Yes to family without violence.” The campaign is a part of the international campaign “ 16 Days of Activism Against Violence Against Women” and dedicated to the International Day for the Elimination of Violence against Women (November 25). #TwiPartyBy. On 26 November, Minsk hosted the First Party of the Belarusian Twitter community – #TwiPartyBy. The offline event attracted about 300 people. They decided what would be the logo of the Belarusian twitter community and honored the most outstanding twitter people. Young Front against official radio. "Young Front" has launched a campaign “Stop feeding the regime.” The organization offers Belarusians to refuse to pay for radio, which broadcasts official news. Thus, the authors of the idea demonstrate ​​their attitude towards government propaganda. New Scholarship Program for Belarusians Opens. Young Belarusians can now apply for scholarships to study for a BA or MA degree at European universities. The Open Europe Scholarship Scheme (OESS) is financed by the European Commission and managed by the Nordic Council of Ministers. The purpose of OESS is to contribute to a democratic and prosperous development in Belarus by giving young Belarusians access to higher education without ideological bias and according to internationally accepted academic standards. The project for the re-socialization of convicts summed up in Homel. On 30 November, a Roundtable in Homel summed up the project “Adult Education for the re-socialization and professionalization of penal institutions.” Gomel regional NGO "Social Projects" with the support of German association "Deutscher Volkshochschulverband e.V." implemented an educational program (a training course of psycho-social support, computer courses and crafts) in two penal colonies. Office for the Rights of People with Disabilities presented an Alternate Report. On 1 December, Educational human rights institution “Office for the Rights of People with Disabilities” held a press conference in Minsk. The topic was a Report (alternate) on support and performance of rights of people with disabilities in Belarus. About 40 people took part in the press conference, including journalists, NGOs, governmental agencies, international organizations. World AIDS Day in Belarus. On 1 December, World AIDS Day, Belarusian HIV NGOs conducted a number of events aimed at bringing people together around the issue and to demonstrate commitment to the fight against AIDS. UN Development Program presented the TV youth 8-series “Above the sky.” The series is dedicated to those who are affected by HIV, and produced on the initiative of the UNDP in collaboration with the Belarusian Ministry of Health for the grant of the Global Fund to Fight AIDS, Tuberculosis and Malaria. Final of the contest “What I know about Europe?” On 3 December, Belarusian Human Rights House in Vilnius hosts the final game of the VIII National Competition of school teams “What I know about Europe?” The competition is organized by Club of European teachers with the support of the Association for International Affairs (Czech Republic) and the Movement “For Freedom”. Festival of Belarusian European Lyric Culture. Cultural Initiative “Your Fest” with the support of “Budzma” presents the First Literary and Musical Festival of Belarusian European Lyric Culture “Love in Belarusian, Live in European!..” Festival guests will see Belarusian poets and musicians of all generations on the one stage. The event will take place on 5-6 December, at the club LOFT, Minsk. International Conference on Ecumenical Dialogue. On 9-10 December, Center "Ekumena" jointly with "Advocates Europe" and "Center for the Study of contemporary religiosity" holds in Minsk a Conference "Dialogue between the society and religious communities and ecumenical dialogue as a factor for sustainable development, pluralism and religious freedom." The conference invites for participation representatives of religious organizations, civil society, governmental bodies, the academic community, diplomatic missions, and lawyers. International Conference in Warsaw. On 9-11 December, in Warsaw, Lazarski University, Konrad-Adenauer-Stiftung and National Endowment for Democracy host an international conference “Belarus and Belarusians among neighbors: historical perceptions versus political constructs”. The goal of the conference is to examine a diverse range of issues regarding the relations of Belarus with its neighbors, including political and economic ties, cultural links, historical stereotypes, and interaction with the nationalities, confessions, cultural groups and NGOs that make up Belarusian civil society. Transforming Belarus: Ways Ahead. On 7 December, in Brussels, Carnegie Europe, the Belarusian Institute for Strategic Studies (BISS), and the Office for a Democratic Belarus will host an expert forum to discuss the European Union’s policies on Belarus in the context of the latest developments in the country. Among speakers there are European Commissioner for Enlargement and European Neighbourhood Policy, Stefan Füle; Pavel Daneyko (Belarusian Economic Research and Outreach Centre); Arkady Moshes (Finnish Institute for International Affairs); and Aliaksei Pikulik (BISS). The event is organized with the support of Pact/USAID. Belarus Digest prepared this overview on the basis of materials provided by Pact. This digest attempts to give a richer picture of the recent political and civil society events in Belarus. It often goes beyond the hot stories already available in English-language media.